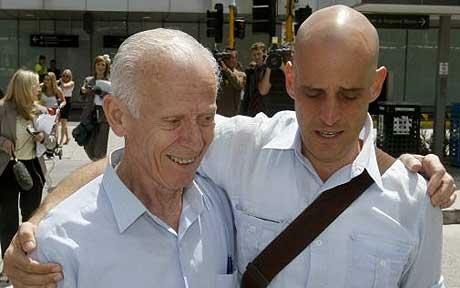 Harry Nicolades six month ordeal is finally over and he is back home in Australia after a Royal pardon set him free just after midnight. Harry learned the news soon after his release of his mothers stroke while he was in a Thai Prison. “I have been crying for eight hours,” he said. “I learned only a few minutes before my flight that my mother had suffered a stroke…. “A few hours before that I was informed I had a royal pardon and asked to kneel before a portrait of the king – a royal audience of sorts. While I’m sure he’s elated to be free I can only imagine the feelings he harbors towards Thailand. Thailand itself lumbers on still seemingly asleep and oblivious to the black eye it has given itself in the world community. Harry Nicolaides was tried and jailed for one sentence about the Thai Prince in a fictional book written years ago that no one had even heard of much less bought, who’s next and what perceived insult will jail them? The newest Thai government is cracking down on what they say are Lese Majeste crimes when in reality they are using people like Harry Nicolaides to further their agenda against political rivals in the country. Anyone speaking out about the government is liable to have a lese majeste charge brought against them , and already more than a few have. Hopefully, sooner than later, someone in Thailand realizes that with each case of lese majeste brough they are marching one step at a time backwards into the dark ages. Thailand has lost face in the worlds view and it seems they are happy to do so. God gives him a lot of courage. Instead of creating a drink, Thailand might want to simply create a safe and free country to improve their image. Harry must be a relieved man now. Well done to you for your help in the campaign for the release of Harry Nicolaides. I hope you celebrate with a drink or two yourself. I didn’t do anything but pass the story on with my comments. Not drinking yet but when I hit the ground next month…Jusry is still out on the new Thailand drink though. I may have to try it. Goodness gracious! how did he fall into a cess pool? Was he nudged into it by the prison wardens who knew that he was going to be freed and that was Thai way of settling the score? Harry now can write a best-seller, that’s the silver lining! martin in bulgarias last blog post..Living or Surviving in Bulgaria? How true Martin. For a writer that couldn’t sell but a few books I have a feeling this is going to be a windfall for him…although I wouldn’t want to spend a night in a Thai jail for any amount of money. Actually it’s not so much the royal family as it is the Thai government using the lese majeste laws to punish people.